Being the first element seen by potential customers, the app’s icon is critically important. It needs to convey what the game is about in an eye catching, memorable way. The best icons accomplish this via the use of vibrant colors and a polished graphical illustration. Very few successful icons contain text. Unfortunately the Tap to Zap icon fails to hit the mark due to its black background and dull, dark color palette. The featured objects (dots) take up only a small percentage of the icon area. These issues lead to an icon that lacks impact and would be unlikely to catch many potential customers eyes as they scanned a page full of other brighter, more colorful and vibrant icons. On an iPhone users see only 2 icons within a search results screen, but users will tend to be scrolling quite quickly, so grabbing their attention with your icon is again a critical requirement. The current name “Tap to Zap” describes the game mechanics well, is quite catchy and memorable, and rolls off the tongue easily. Having said all of that, it could be improved upon by extending the name to include more keywords, while keeping it 35 characters or less to avoid the name being cut short when displayed in App Store search results. All words in the app name are viewed as keywords by the App Store search algorithm and words within the app name carry the greatest weighting, so it pays to take advantage of this, if possible, by including relevant and strong keywords in your app name without just keyword stuffing for the sake of it. 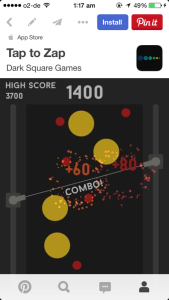 A few suggestions are “Tap to Zap – Dots Shooter”, “Tap to Zap – Laser Dots” or “Tap to Zap – Laser Cannon Wars”. Most people who get as far as tapping your icon will only read the first sentence or two of your description (if you’re lucky), so you only have a few seconds to grab their attention and make them want to read on, or tap the “Get” button. It’s generally recommended to make your description long enough to include all relevant information and features, but ensuring that each piece of writing is concise and to the point. So don’t place your focus on keeping it short, but don’t pad out text purely to end up with a longer description. You should make use of bullet points where possible, use short sentence structures, and keep words simple to make is easy to read and understand, including for people whose first language may not be English. 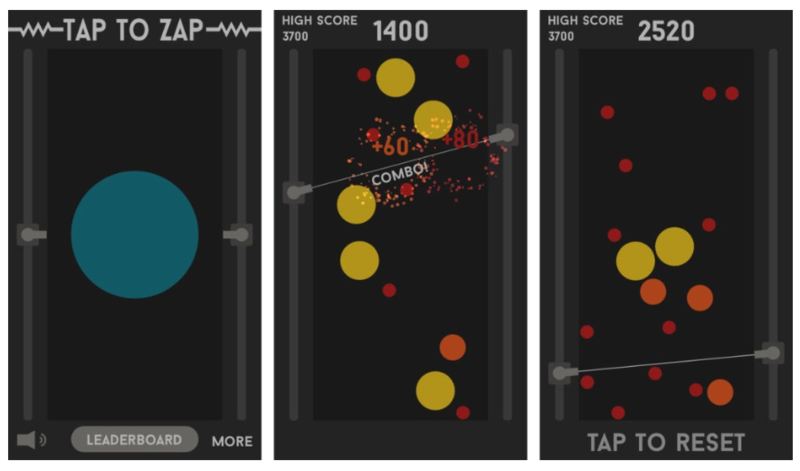 Tap to Zap is a fun one-touch arcade game. Follow the laser zappers and once aligned with the balls bouncing around the screen, release the fury of a thousand years by tapping the screen and bursting the balls to oblivion while creating 2 smaller versions of the ball.. This game is designed for people who like to zap things. Sound fun? We think so!! Fire your laser cannons to blast cosmic dots to pieces, but be precise as one miss and your mission is over! 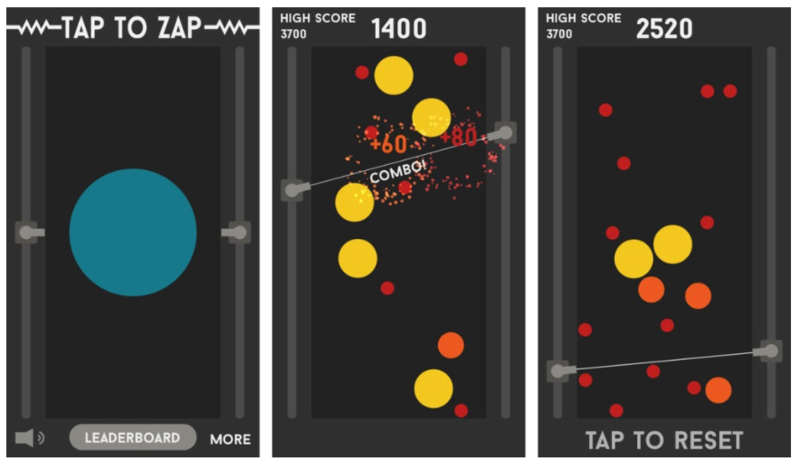 Tap to Zap is a casual endless shooter style game where dots have to be blasted when caught between the two laser cannons you command. A perfect balance of speed and patience is required as you aim to blast as many dots as possible, while ensuring the moving laser cannons have at least one target between them before firing! The game starts with a single large static dot. When shot it splits into two smaller dots and these begin to move randomly around the gameplay area. Every time a dot gets blasted by your laser cannons it again splits in two, creating an increasing number of smaller and smaller dots. Be patient and be precise, as the first time you shoot your lasers but fail to hit any dots… game over! Screenshots are another critically important element when it comes to enticing potential customers to tap the “Get” button. They should be eye-catching and aim to show the best parts of your app. As with the icon, the colors in the screenshots are muted and do not match the vibrancy of the colors in the actual app. Compare the existing screenshots (above) to an adjusted set below. Your game would also be well suited to the recently introduced App Preview option offered by Apple. This is a short video of your game being played. The ideal keywords are those that strike the right balance between relevancy to your app, search volume, and level of competition. In a perfect world you want to use only keywords that are searched for often, bring up only a handful of apps when searched for in the App Store and are highly relevant to your app. Unfortunately very few, if any, such keywords exist these days, so you are aiming to select those that hit the best balance. A good place to start is to write down every word you can think of that relates to your app. From that list you then want to check the expected App Store search volume for each one and note the number of competitors, i.e. the total number of apps returned when you carry out an App Store search using each keyword. Beyond that you need to analyze your target audience and think of the words and terms they are most likely to be using when looking for games to download. Apple allow 100 characters for your keyword list which includes the comma used to separate each word. To optimise your allowance DO NOT use spaces between words. Maximize your benefit by using all 100 characters, or as close to 100 as possible. If you choose to extend the game name, as suggested earlier, by adding more words, be sure to remove any words used from your keyword list (including the suggested list above), and replace them with others. When presented with a list of app options, potential customers will tend to tap more on those with high average ratings. The problem is that Apple require 5 ratings to be recorded before they will display an average rating for your app in search results, this includes updates to your app. When you release an update Apple resets all ratings data for your app back to zero (ratings for prior versions are still available on the main app page if the user taps the “Reviews” button then “All Versions”). Recent ratings and reviews can help boost your app in the eyes of the search algorithm, with greater weight being given to the most recent ratings. Currently Tap to Zap has 4 reviews with an average rating of 4.3 stars (1 in each of India, Finland, Australia and Italy). This means no average rating will be displayed by Apple in any of its worldwide app stores. You should attempt to encourage users, friends and family to rate and review your app. Though if you plan to release an update wait until the update hits the App Store before putting this ratings / review push into action. Thanks to Iain I have a big list of possible improvements to consider for Tap To Zap and a definite list of things to remember for my future apps. There will surely be an update to Tap to Zap in the near future. I want to thank Iain very much for helping me out and teaching me so many things about ASO. This is a great starting point to build on. You should really check out their website as well as their newest game QuickFlicks for iOS which is a fun reaction based finger flicking game. 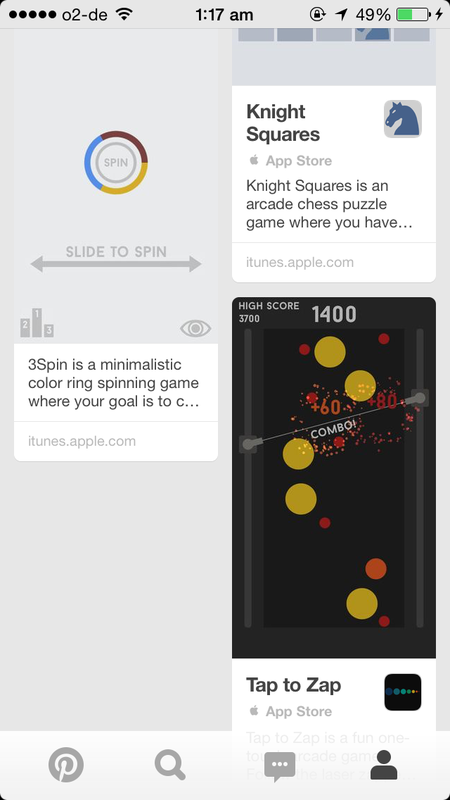 On Wednesday 3Spin was finally being approved by AppStore. There was a last minute scare as the app actually got rejected by the reviewer. I had mentioned there to be ads in the game but I had turned off the Chartboost test ads and when the reviewer didn’t find them, the app got rejected (poor guy, I wonder how long he played the game for in hopes of finding the ads) but luckily he got back to me quickly and we got it resolved in like 15 minutes and the app was ready to go live. Newbie mistake! I published the app on Tuesday night and immediately got some nice feedback on Twitter. I was excited to see the downloads in the morning and was very surprised to notice that the game had been mentioned in several gaming websites. The source for the news was no other than Pocket Gamer. This was extremely exciting as I didn’t even contact them beforehand. 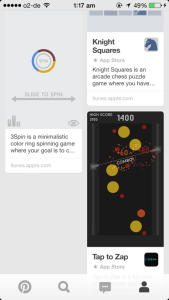 The article, ‘3Spin is a free reflex-based game about matching colors, on iOS now‘ was written by Chloi Rad and mostly touched the colorblind friendliness in the article, which seemed to be the focal point of most comments about the game. The game was described as either “colorblind friendly” or “hard” which I suppose are as good adjectives as any! I guess it really paid off adding those color selection options into the game. The first full day brought almost 200 downloads which was a solid start. Getting the game noticed in the Arcade/Action categories seems to be quite difficult as those categories seem to have tons of games each day. However the numbers are still looking good and I’m thinking of ways to improve the game and the results. Another nice thing that happened was that Jane Jones included 3Spin in one of her Youtube reviews again, check out how she did and make sure to subscribe to her channel! One thing I’m really trying to learn about lately is ASO (App Store Optimisation) which includes all the things you do while submitting your app to the app store. I realised I have a lot to learn about writing descriptions, selecting screenshots and selecting keywords for my apps and I will be seeking for some help here with these questions and I will write about my learnings in future posts. My board on the Pinterest iOS app. You can see in the bottom right image that there is a direct Install button that allows users to easily install apps through the Pinterest app. And I think this is great! If for example someone searches for ‘Sports’, they might find relevant sport related apps and games and could directly install them through the Pinterest app. My first instinct after adding my own apps to my board was to create a board based on my current wish list on my App Store app. I’ve never really been a very active Pinterest user but I see a lot of apps on daily basis and it would be fun to have a public collection of interesting apps that I could easily share with my friends and followers. I’d imagine this could also be interesting for many others. As a developer I sincerely hope this will make the app discovering at least somewhat easier! We all know finding relevant apps and getting your own apps noticed is extremely hard. The feature currently only supports iOS but must surely be targeting other platforms in the future. You can find my apps neatly in a row in my board here.